With all eyes on US CPI inflation data tomorrow to confirm the overheating aspects of last Friday's blistering hot jobs report, moments ago the BLS reported that wholesale inflation in the form of producer prices unexpectedly fell in August, its first drop in 18 months since last February; the decline followed an unchanged print in July and missed expectations of a 0.2% increase. On an annual basis, headline PPI rose just 2.8% y/y, missing expectations of a 3.2% print and down from 3.3% last month; core PPI was up 2.3% y/y, missing the estimate of 2.7%, and down from last month's 2.7% print. According to the BLS, the decline in the PPI reflected a 0.1 percent drop in the cost of services - more than 80% of which was accounted for by falling margins for machinery and equipment wholesaling. Additionally, the indexes for health, beauty, and optical goods retailing; application software publishing; airline passenger services; and hospital outpatient care also moved lower. On the other hand, prices for loan services (partial) jumped 3.0%. The indexes for food retailing, bundled wired telecommunication access services, and physician care also rose. Goods prices were unchanged, as a 0.6% drop in food costs offset a 0.4% increase in energy. 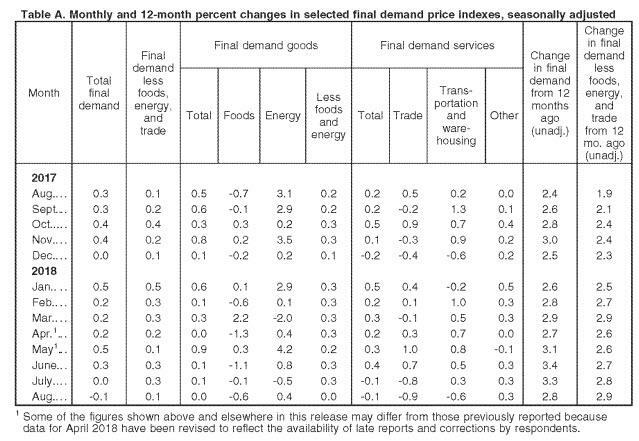 While headline PPI fell, underlying producer prices rose, as core PPI - excluding food, energy, and trade services costs - rose 0.1% from the previous month following a 0.3% increase, however that too missed the 0.2% consensus print. The report also notes that in August, the index for residential electric power moved up 0.6 percent. Prices for fresh and dry vegetables, corn, gasoline, and passenger cars also increased. In contrast, the index for fresh fruits and melons dropped 11.3 percent. Prices for diesel fuel, meats, eggs for fresh use, and iron and steel scrap also declined. But perhaps the most interesting part of the report is that trucking costs finally posted their first monthly drop since early 2017, suggesting that one of the biggest drivers of inflation recently - and a harbinger of trade - is finally rolling over. According to Bloomberg, today's unexpectedly soft data suggest that inflationary pressures may be taking a breather even as most signs of economic growth remain solid. Analysts are also watching for signs of how trade tariffs and retaliatory levies are affecting companies, particularly how they are filtering through the production pipeline to other businesses and consumers.